Accurate and constant monitoring of key points of the network could allow water companies to stop leaks and pipe bursts before they occur. Mathew Beech reports. For the sixth asset management plan period, AMP6, Ofwat told the water companies they must save a total of 370 million litres of water a day and cut the time customers are off supply. A large chunk of this saving can come through tackling leakage from the networks, which actually saw an increase of 0.7 per cent last year. If companies fail to meet the targets mandated by Ofwat, they face potential fines of up to £500 million. So the incentive is there to tackle leakage, and the shift away from a capex and opex regime to one looking at total expenditure, or totex, has granted the water companies a new freedom to find innovative solutions for dealing with their leaky networks. This is where Syrinix comes in, and in particular its new PipeMinder product. It was developed in close co-operation with Thames Water and is designed to help water companies find and deal with potential leaks before they arise. This makes the maintenance of the network more efficient, and helps to drastically cut leakage, which is key in helping water companies meet their targets and avoid hefty penalties . Syrinix chief executive James Dunning says that in some areas, the rates of leakage could be slashed by half, although typically a reduction in leakage of 5-10 per cent can be expected. He says the “big wins” in tackling leakage have already been had, and the new targets and financial restrictions of AMP6 have made life difficult for water companies. Getting detailed information about how the network is performing is going to enable “that step change in performance that the regulator is demanding”, according to Dunning. Diagnostic tools in the water network to identify weaknesses and areas of potential stress are not new. What makes PipeMinder a game changer is its combination of hardware and software. Previous data loggers have been a compromise: low quality data and a long battery life, or high quality data but a short battery life. PipeMinder combines both. It offers high-resolution data and has a five-year battery life, meaning it can be permanently deployed in the network. “If you imagine a valley full of mist and fog, that’s similar to the view a lot of utilities have of their network,” says Dunning. The hardware of PipeMinder can also switch between what data it collects and reports back; all it requires is a software upgrade. This is another string to its bow, meaning that water companies can cut down on the number of different data loggers they deploy across their networks. Dunning gives the example of Thames Water, which went out to tender for 12,000 data loggers for a total of six different purposes. There is also the ability to switch remotely between the type of data being collected, allowing it to change between flow and pressure monitoring. The final element for the Syrinix system is the Radar cloud-based analytics platform that collects and interprets the data from PipeMinder. This handles the data that comes in and can generate automatic alerts. These alerts can be scheduled to be issued on a daily basis and they can provide warnings about pressure points building up, which could mean an imminent leak or burst occurring. This allows preventative action to be taken. The detail the system generates allows companies to monitor how their networks are running, highlighting any weak points. This allows them to adjust flows, alleviating some of the stresses on the pipework, or take preventative action as necessary, with the end result of extending the life of assets and reducing leakage. PipeMinder continuously measures the pressure and flow of water travelling through the pipeline at a high definition rate of 128 samples per second. The data is precision time stamped via GPS, even while the units are deployed underground. This data is processed through a series of algorithms, the measure of transient activity calculated and then displayed as a graphical representation. This highlights damaging transient stresses on a network, further aiding utilities to calm their networks. The information is transmitted via quadband 3G communication technology, deployed with a standard size Sim card, which ensures compatibility across multiple networks. Syrinix is working with the “majority of water companies in the UK” and a host of clients in North America and Australia. The PipeMinder device is new to the market, but Thames Water is set deploy it across its network, having been closely involved with Syrinix in its development. The company has also worked closely with Crossrail to monitor critical water mains during the tunnelling of the East-West rail link. 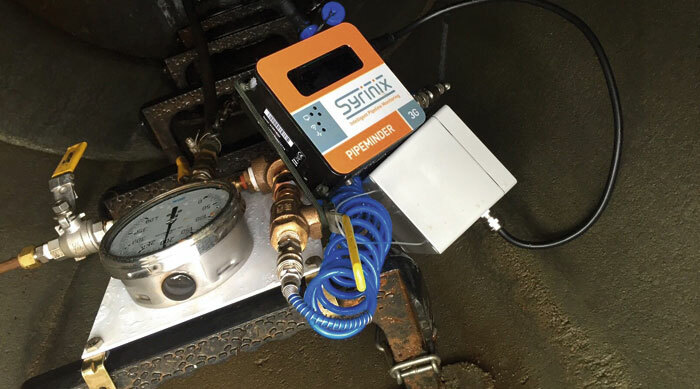 Syrinix’s TrunkMinder solution captures and documents conditions in nearby water pipes and monitors the immediate effects of major construction activity.